Enolates of carbonyl compounds will react with alkyl halides in SN2 reactions to give alkylation products. Aldehydes and ketones generate enolates by treating the bases which may participate in SN2 alkylation reactions with suitable alkyl halides, forming a new carbon-carbon bond in the process. In practice, however, the reaction can be complicated and difficult to control. The enolate ion is a fairly strong base. When forming the enolate for an alkylation process, the choice of base is important in order to avoid side effects. With a stronger base, such as LDA, these problems are avoided. With this base, the ketone is irreversibly and quantitatively deprotonated to form enolate ions. In the first step, the base (LDA) removes a proton from the α carbon to produce an enolate. In the second step, the enolate function as a nucleophile and attacks the alkyl halide, displacing the halide as a good leaving group. The alkylation product is formed by the SN2 reaction. 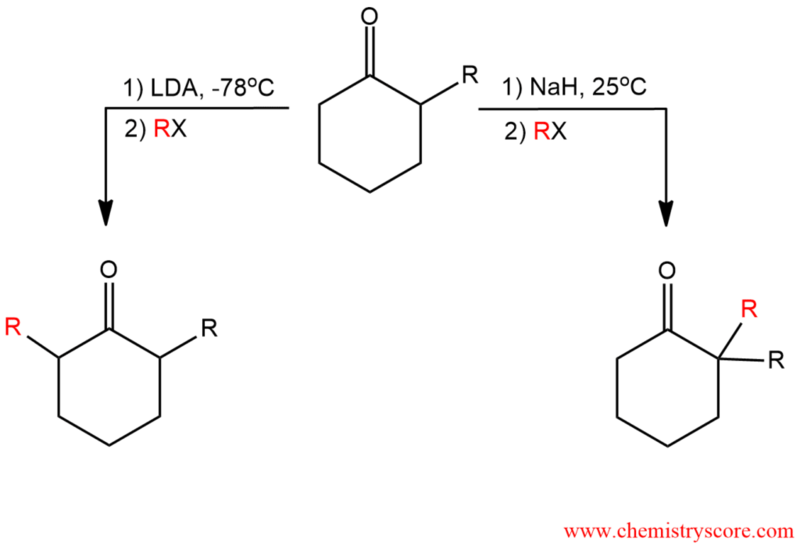 This reaction works best with methyl and primary alkyl halides. Hindered alkyl halides and those with halides bonded to sp² hybridized carbon do not undergo substitution. With unsymmetrical ketones that have α hydrogen on both sides of the carbonyl group, two possible enolates can be formed. It depends on the use of the appropriate base, solvent, and temperature. The more-substituted enolate is more stable and is called the thermodynamic enolate. The less-substituted enolate is less stable, but it is formed more rapidly and is therefore called the kinetic enolate.